IMPORTANT: Storyboard Pro does not support import of 8-bit CMYK or 16-bit RGB or CMYK format PSD files. You can currently import only 8-bit RGBA format PSD files. NOTE: To select multiple images, hold down [Ctrl] (Windows) or [⌘] (Mac OS X) as you click. ‣ Click Yes to import each layer on its own layer in the panel. 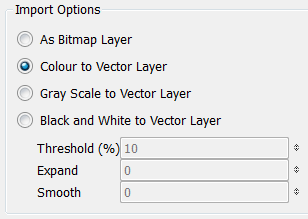 ‣ Click No to create a layer behind the existing layers, containing the selected *.psd image. ‣ As Bitmap Layer: Preserves the exact look of the imported images and imports it in a bitmap layer. ‣ Colour to Vector Layer: Preserves the exact look of the imported images and imports it in a vector layer. 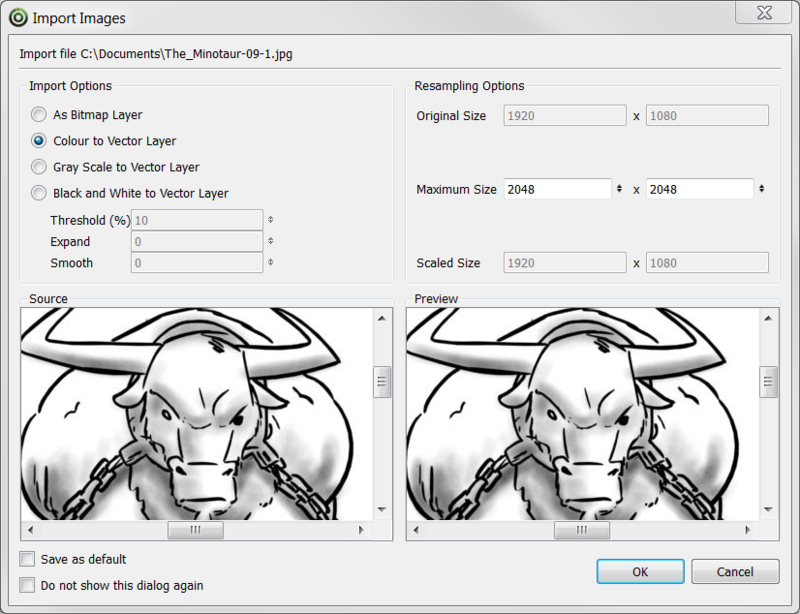 ‣ Gray Scale to Vector Layer: Imports the selected images as a gray scale in a vector layer. ‣ Threshold (%): Filters out noise in your images. Noise can be dirt or faint smudges on your scanned images. For example, if your value is set to 70%, all colour values below 70% are converted to white and ignored in the final image. If your value is set to 100%, only completely black lines will be kept. ‣ Expand: Enter a value between 1 and 100 to thicken lines or the outer edges of the bitmap. Use this option if your line art is too fine or pale so that their visibility is increased in the software. ‣ Smooth: Enter a value between 1 and 5 to set the smoothness level. Greater smoothness equals less jaggedness and imperfections, but at a greater loss to detail. ‣ Maximum Size: Enter a specific maximum size for your imported image to be scaled down to. The original ratio of the image will be preserved during the operation. You can see the final values resulting from the scaling process in the Scale Size fields. Note that you can not use these fields to scale up an image. ‣ Scaled Size: Displays the final size the image will be scaled after it is imported in your project. ‣ Saves as default: Saves the current settings. Every time you open this dialog box, the new default parameters will automatically be set. The import images commands will still use this new default even if you deselect the Display Vectorize Options Dialog preferences. ‣ Do not show this dialog again: Deselect the Display Vectorize Options dialog option in the Preferences dialog box directly from here.